First three-crew spaceflight. Altitude record (336 km). First crew to fly without spacesuits. First non-pilot crew (engineer that designed the spacecraft and a physician). AKA: Rubin (Ruby). Launched: 1964-10-12. Returned: 1964-10-13. Number crew: 3 . Duration: 1.01 days. Location: RKK Energia Museum, Korolev, Russia. The U.S.S.R. launched the world's first multi-manned spacecraft, Voskhod I , the first to carry a scientist and a physician into space. The crew were Col. Vladimir Komarov, pilot; Konstantin Feoktistov, scientist; and Boris Yegorov, physician. Potentially dangerous modification of Vostok to upstage American Gemini flights; no spacesuits, ejection seats, or escape tower. One concession was backup solid retrorocket package mounted on nose of spacecraft. Seats mounted perpendicular to Vostok ejection seat position, so crew had to crane their necks to read instruments, still mounted in their original orientation. Tested the new multi-seat space ship; investigated the in-flight work potential and co-operation of a group of cosmonauts consisting of specialists in different branches of science and technology; conducted scientific physico-technical and medico-biological research. The mission featured television pictures of the crew from space. Land recovery made possible by rocket package suspended above capsule in parachute lines, which ignited just prior to impact in order to cushion landing. The trio landed after 16 orbits of the earth, 24 hours and 17 min after they had left, on October 13, 1964 7:47 GMT. Coming before the two-man Gemini flights, Voskhod 1 had a significant worldwide impact. In the United States, the "space race" was again running under the green flag. NASA Administrator James E. Webb, commenting on the spectacular, called it a "significant space accomplishment." It was, he said, "a clear indication that the Russians are continuing a large space program for the achievement of national power and prestige." Huge controversy between military, that wanted all-pilot crew, and Korolev, who wanted to start sending engineers, doctors, even journalists and poets into space. Feoktistov, lead designer of Vostok and Soyuz, showed his faith in design by getting a seat aboard, becoming the only spacecraft designer ever to fly in space. Yegorov, the medical doctor, managed to get a seat through his father's connections in the Politburo. Khrushchev was removed from power while the crew was in flight - it was perhaps supposed to go longer, but ground control cryptically informed the crew that 'there is more in heaven and earth than is dreamt of in your philosophy...' and ordered them back. Family: Manned spaceflight. People: Feoktistov, Komarov, Yegorov. Country: Russia. Spacecraft: Voskhod. Launch Sites: Baikonur. Agency: Korolev bureau. 1964 February 5 - . Soyuz mock-up - . Nation: Russia. Related Persons: Korolev. Program: Vostok, Lunar L1. Flight: Soyuz A-1, Soyuz A-2, Soyuz A-3, Soyuz A-4, Voskhod 1, Voskhod 2, Vostok 10, Vostok 11, Vostok 12, Vostok 13, Vostok 7, Vostok 8, Vostok 9. Spacecraft: Vostok. The cosmonauts visit Korolev at OKB-1 for the first viewing of the mock-up of the Soyuz spacecraft. Korolev announces that single-place Vostoks will fly no more, and that instead four of the spacecraft will be completed during 1964 to take three crew members. This decision has been taken since it was now certain that Soyuz will not be ready to fly in 1964, and the impending first flights of American Gemini and Apollo spacecraft will give the USA a lead in manned spaceflight before Soyuz missions can be flown. Kamanin is disturbed by the decision. He recalls that in 1961 flight of the Vostok with two or three crew was discussed, with flights to occur in 1962-1963. But at that time Korolev cancelled the plans, saying the Soyuz would be used for such missions. Now Soyuz will not fly until 1965, and he has changed his tune. Furthermore, the modified Vostok is inherently risky, with no way to save the crew in case of a launch vehicle malfunction in the first 40 seconds of flight. Unlike Vostok, the three crew will not have individual ejection seats or parachutes to give them a chance of escape in the event of an abort. The crew will be subject to 10 to 25 G's during an abort. There is no assurance the environmental control system can be modified to handle three crew. It all seems very unsafe, and Kamanin believes the six consecutive successful Vostok flights have given Korolev's engineers a false sense of the safety of the Vostok system. Kamanin is perplexed. How does he plan to convert a single-place spacecraft to a three-place spacecraft in a few months? Korolev has no clear answers, but asks for the cosmonauts' support of the scheme. 1964 February 8 - . VVS Meeting on Voskhod - . Nation: Russia. Program: Voskhod, Vostok. Flight: Voskhod 1, Vostok 10, Vostok 7, Vostok 8, Vostok 9. Spacecraft Bus: Vostok. Spacecraft: Voskhod. Leading responsible VVS officers meet to develop an Air Force position on Korolev's plan to fly a three-place version of Vostok by the autumn. They see the plan as extremely risky, with insufficient time to design, implement, and test the modified design..
1964 March 13 - . Voskhod spacecraft approved. - . Nation: Russia. Program: Voskhod, Vostok. Flight: Voskhod 1, Voskhod 2, Vostok 10, Vostok 7, Vostok 8, Vostok 9. Spacecraft Bus: Vostok. Spacecraft: Voskhod. Military-Industrial Commission (VPK) Decree 59 'On approval of work to convert Vostok to Voskhod and use it for three-person space missions' is issued. The resolution instructs GKOT to complete four Vostok spacecraft to the multi-passenger Voskhod configuration. The first is to be completed by 15 June 1964; the second by 30 June; the third and fourth, in July. The crew for the first mission will consist of a pilot-cosmonaut, a scientist, and a physician. Launch is set for the first half of August 1965. 1964 March 14 - . Voskhod plans - . Nation: Russia. Related Persons: Keldysh, Korolev, Smirnov. Program: Voskhod. Flight: Voskhod 1. Spacecraft Bus: Vostok. Spacecraft: Voskhod. VVS officers meet to plan training for the Voskhod 1 crew. It is agreed that a passenger-cosmonaut can be trained within three months. That means, in order to be ready for an August mission, the candidates for the scientist- and physician-cosmonaut seats will have to be identified, screened, and selected by 30 April. It is estimated that 30 physician and 30 scientist candidates will have to be submitted to the medical commission in order for the necessary six finalists to get through the screening. Kamanin privately believes this is all an insanely dangerous adventure. Smirnov, Keldysh, and Korolev have gone off the rails in their desire to make sure that the Americans do not seize and space 'firsts' once the Gemini flights begin. 1964 March 21 - . Voskhod commander assignment - . Nation: Russia. Related Persons: Gagarin, Khrushchev, Nikolayev, Tereshkova. Program: Voskhod. Flight: Voskhod 1. Spacecraft Bus: Vostok. Spacecraft: Voskhod. Kamanin meets with Nikolayev, who briefs him on his goodwill tour of Soviet cities. Kamanin shows him a 200-rouble fine art book on the first space missions, of which he has received only six copies to distribute. Nikolayev would like one, but Kamanin says it is reserved for Tereshkova. Gagarin later briefs Kamanin on his tour of Western Europe. Gagarin is interested in commanding the Voskhod 1 mission, but Kamanin believes it is too risky. However the excuse he gives to Gagarin is that none of the flown cosmonauts are flight-ready due to constant publicity tours. Given only three months to prepare for the flight, the commander will have to be one of the unflown cosmonauts current in training. Later Kamanin formulates a position for the General Staff on the Voskhod flights. The VVS should promise full support for the Party's resolution, while pointing out the risks and the unreliability of the Voskhod design. Kamanin is told the support will be transmitted, but the qualifiers will not. Kamanin fumes that Khrushchev has given the go-ahead to proceed without being informed at all of the grave risks. 1964 March 27 - . Voskhod candidates - . Nation: Russia. Related Persons: Bykovsky, Keldysh, Korolev, Popovich, Titov. Program: Voskhod. Flight: Voskhod 1. Spacecraft Bus: Vostok. Spacecraft: Voskhod. Kamanin works out with the other ministries the criteria for the Voskhod crew. The commander will be a trained unflown cosmonaut. The others have to be civilians. The VVS will be responsible for training the passengers on a three-month schedule. Candidates will be considered from OKB-1, the Academy of Science, the IAKM (Institute of Aviation and Space Medicine) and the DOSAAF civilian flying organisation. After General staff review, it is decided the commander will be a flown cosmonaut (Titov, Bykovsky, or Popovich): that Korolev will submit six engineer-cosmonaut candidates from within OKB-1; that Korolev will co-ordinate submittal of a small group of physician-cosmonaut candidates; and that Keldysh will submit scientists from the Academy. 1964 April 3 - . Physical requirements for Voskhod passengers established - . Nation: Russia. Program: Voskhod. Flight: Voskhod 1. Spacecraft Bus: Vostok. Spacecraft: Voskhod. The candidates will have to be under 40 years old, 160 to 175 centimetres in height, and under 80 kg in weight. They must basically be in perfect health, with tested tolerance to vestibular disruption, and screened for other known physical conditions that might interfere with spaceflight. 1964 April 4 - . Voskhod training groups - . Nation: Russia. Related Persons: Gagarin, Khrushchev, Nikolayev. Program: Voskhod. Flight: Voskhod 1. Spacecraft Bus: Vostok. Spacecraft: Voskhod. Kamanin has decided to train two groups in parallel: flown cosmonauts (Titov, Bykovsky, and Popovich), and passenger-cosmonauts. Gagarin and Nikolayev oppose plans to fly non-military personnel in space. Kamanin observes with disgust that Khrushchev is handing out medals meant for true Soviet heroes to himself and foreign leaders such as Janos Kadar and Fidel Castro. He observes that Khrushchev will turn 70 on April 17, and no longer enjoys support from the military or other sectors of the state. Kamanin recites what he sees as Khrushchev's mistakes: his denunciation of Stalin, his ruining of relations with other Communist states such as Yugoslavia, Albania, and China; and he has ruined the Soviet domestic economy, with basic foodstuffs suffering in quality and quantity. 1964 April 13 - . Korolev and crew selection - . Nation: Russia. Related Persons: Korolev. Program: Voskhod. Flight: Voskhod 1. Spacecraft Bus: Vostok. Spacecraft: Voskhod. Korolev is categorically against assigning a flown cosmonaut to the Voskhod mission. He also makes light of the training requirements for the passenger-cosmonauts. He is wreaking havoc with Kamanin's crew plans with his positions, and creating unrest among the cosmonaut corps. Construction of nine Voskhod spacecraft approved. - . Nation: Russia. Program: Voskhod. Flight: Voskhod 1, Voskhod 2. Spacecraft Bus: Vostok. Spacecraft: Voskhod. Central Committee of the Communist Party and Council of Soviet Ministers Decree 'On approval of work on four Voskhods and five EVA-equipped Vykhods' was issued. Work on the 3KV (three crew) and 3KD (two crew plus inflatable airlock) versions of the basic Vostok spacecraft began. 1964 April 23 - . Voskhod crews - . Nation: Russia. Related Persons: Belyayev, Bykovsky, Demin, Khrunov, Komarov, Leonov, Popovich, Titov, Volynov. Program: Voskhod. Flight: Voskhod 1. Spacecraft Bus: Vostok. Spacecraft: Voskhod. Komarov has declared that nine cosmonauts are spaceflight-ready: Bykovsky, Popovich, Titov, Volynov, Leonov, Khrunov, Belyayev, Komarov, and Demin. One of these will command Voskhod, the other two seats will be occupied by a physician and an engineer or news correspondent. Kamanin is given only two to three months to prepare the passengers for spaceflight - something he reiterates is a dangerous adventure. Voskhod plans - . Nation: Russia. Related Persons: Biryuzov, Korolev. Program: Voskhod, Vostok. Flight: Voskhod 1, Voskhod 2, Vostok 10, Vostok 7, Vostok 8, Vostok 9. Spacecraft: Berkut, Voskhod. Kamanin receives the directive issued by Biryuzov to implement the Voskhod Party resolutions. Four spacecraft will be completed, two in a three-man configuration, to be flown in the second half of 1964, and two in a configuration that will provide an airlock and allow one cosmonaut to exit into open space. Less than a year is allowed to develop the new spacecraft version for the spacewalk, as well as develop the space suit. This will be a crash priority program, and allow Korolev no resources to complete and launch five Vostok spacecraft on manned and life sciences missions beginning in May. 1964 May 5 - . Voskhod passengers. - . Nation: Russia. Related Persons: Korolev. Program: Voskhod. Flight: Voskhod 1. Spacecraft Bus: Vostok. Spacecraft: Voskhod. 50 candidates from VVS institutes, Minzdrav, and the Academy of Science have been screened, and 36 were immediately ruled out, leaving 14 for medical screening. As for OKB-1 candidates, Korolev had not yet submitted a single name, and time for training is running out quickly. 1964 May 7 - . Voskhod showdown - . Nation: Russia. Related Persons: Khrushchev, Korolev. Program: Voskhod. Flight: Voskhod 1, Voskhod 2. Spacecraft Bus: Vostok. Spacecraft: Voskhod. Korolev meets with the cosmonauts, VVS, and RVSN staff to discuss concerns as to the safety of Voskhod. As for flying without spacesuits, Korolev points out than in 14 Zenit-2/Zenit-4 and 10 Vostok flights there has not been a single instance of loss of cabin pressure. He conveniently omits stating that the suit used on the Vostok missions allowed the cosmonaut 4 to 6 hours of oxygen supply to return to earth in case of cabin depressurisation; but on Voskhod the crew will perish. As for individual crew parachutes, he believes they are useless since the crew would not get a chance to use them in an emergency anyway. Korolev sold Khrushchev on the mission by characterising Voskhod as a modification of the reliable Vostok spacecraft. However, he did inform Khrushchev that the risk of loss of the crew on a Voskhod flight was greater than on a Vostok flight. However it was decided this risk was worth taking in exchange for the great political effect of having the first multi-man crew in space. 1964 May 12 - . LV Family: N1. Launch Vehicle: N1 1962. Korolev's plans - . Nation: Russia. Related Persons: Korolev. Program: Voskhod, Lunar L1. Flight: Soyuz A-1, Soyuz A-2, Soyuz A-3, Soyuz A-4, Voskhod 1, Voskhod 2, Voskhod 3, Voskhod 4, Voskhod 5, Voskhod 6. Spacecraft: Soyuz A, Soyuz B, Soyuz V, Voskhod. While Kamanin is away arranging screening of Voskhod candidates, Korolev meets with the VVS General Staff. He tells them he wants to have four Voskhods completed by the anniversary of the October Resolution for the first spacewalk. He dreams of a manned lunar flyby by either docking Soyuz A-B-V modules in orbit, or in a single N1 launch (no metal has even yet been cut for the N1 at Kuibyshev). In order to further develop EVA techniques he wants to convert a further five Vostoks into the Voskhod configuration. Meanwhile Kamanin agrees to a compression of the medical screening schedule from 20-25 days to 15-17 days. The physicians will reduce it no further than this. 1964 May 18 - . OKB-1 Voskhod candidates - . Nation: Russia. Related Persons: Feoktistov, Grechko, Kubasov, Makarov, Volkov, Yazdovskiy, Zaitsev. Program: Voskhod. Flight: Voskhod 1. Spacecraft Bus: Vostok. Spacecraft: Voskhod. Of 14 engineering cosmonaut candidates finally submitted by Korolev, only 6 survived preliminary screening and were sent for medical screening (Volkov, Grechko, Zaitsev, Kubasov, Makarov, Siborov, Feoktistov, and Yazdovskiy)..
1964 May 21 - . Voskhod configurations - . Nation: Russia. Related Persons: Bushuyev, Khrunov, Komarov, Korolev, Leonov, Volynov. Program: Voskhod. Flight: Voskhod 1, Voskhod 2. Spacecraft: Berkut, Sokol SK-1, Voskhod. A meeting of Generals Kholodkov (VVS) and Yuryshev (General Staff) reviews military space plans - launch centres, anti-satellite forces, command and control systems. Kamanin looks forward to the VVS taking control of military cosmonautics. Later a meeting with Korolev and Bushuyev reviews Voskhod crew plans. It is agreed that the commanders will be selected from among the four flight-ready unflown cosmonauts (Volynov, Komarov, Leonov, Khrunov). Korolev describes in detail for the first time the inflatable airlock that is to be fitted to four Voskhods to allow one cosmonaut to exit into space. Korolev believes it will be possible to use the existing Vostok spacesuit for this operation, but Kamanin severely doubts this. 1964 May 27 - . Voskhod passenger candidates - . Nation: Russia. Related Persons: Katys, Lazarev, Moskalyov, Polyakov, Sorokin, Yegorov. Program: Voskhod. Flight: Voskhod 1. Spacecraft Bus: Vostok. Spacecraft: Voskhod. After screening the flight candidates have been boiled down to four: Lazarev, Yegorov, Polyakov, and Sorokin. Moskalev and Katys are the remaining scientist-passenger candidates. Kamanin believes Katys, with a doctorate in technical sciences, is the better candidate and definitely superior to any of the OKB-1 engineer candidates. 1964 May 29 - . Voskhod passenger candidates - . Nation: Russia. Related Persons: Katys, Lazarev, Polyakov, Sorokin, Yegorov. Program: Voskhod. Flight: Voskhod 1. Spacecraft Bus: Vostok. Spacecraft: Voskhod. Following final review, the General Staff ordered Lazarev, Yegorov, Polyakov, Sorokin, and Katys to enter training for flight aboard the Voskhod spacecraft..
1964 June 4 - . Voskhod technical review - . Nation: Russia. Related Persons: Korolev. Program: Voskhod. Flight: Voskhod 1, Voskhod 2. Spacecraft Bus: Vostok. Spacecraft: Voskhod. Korolev presents the Voskhod technical design to organisations outside of OKB-1. Over 27 VVS representatives, including 10 cosmonauts, attend. The two Vostok variants have been dubbed 3KV (3-crew version) and 3KD (2 crew version with airlock). Korolev will complete integration of the first 3KV article by 12 June (8 days from the briefing). The first two articles will be shipped to Baikonur on 15 June for final test. An unmanned test flight with mannequins will be made in July, with the first three-crew manned flight in August. This will be followed by the first 3KD flight in September, with the first spacewalk. The difficulty in preparing equipment and training crews on this schedule are immense; and the chances of complete success are low. But it is the only way the Soviet Union can maintain its leadership in space in the face of the impending Gemini and Apollo flight tests, and the delays in Soyuz. After the meeting, Kamanin decides to train two cosmonauts as Voskhod spacecraft commanders, and the other three as spacewalkers. 1964 June 11 - . Feoktistov - . Nation: Russia. Related Persons: Feoktistov, Korolev. Program: Voskhod. Flight: Voskhod 1. Spacecraft Bus: Vostok. Spacecraft: Voskhod. Korolev has put forth Feoktistov as the sole candidate for the engineer-passenger position on Voskhod. Kamanin is upset, since he believes a backup is needed, and there were five candidates originally..
1964 June 14 - . Voskhod development approved. - . Nation: Russia. Program: Voskhod. Flight: Voskhod 1, Voskhod 2. Spacecraft Bus: Vostok. Spacecraft: Voskhod. Decree 'On approval of work on Voskhod and Vykhod' was issued..
1964 July 2 - . Voskhod and Soyuz crewing - . Nation: Russia. Related Persons: Benderov, Beregovoi, Feoktistov, Katys, Komarov, Lazarev, Polyakov, Sorokin, Titov, Volynov, Yegorov. Program: Voskhod, Lunar L1. Flight: Soyuz A-4, Voskhod 1. Spacecraft: Soyuz A, Voskhod. Benderov has been washed out of training after haemorrhaging excessively during centrifuge training, and Polyakov after reacting poorly to the barometric chamber. This leaves only seven cosmonauts in training for the first mission: Volynov, Katys, Komarov, Yegorov, Sorokin, Lazarev, and Feoktistov. The first six are qualified for flight, but Feoktistiov cannot be admitted for parachute or flight training; his visual acuity is only 0.3. Later the cosmonaut party collective meets to take up the problem of Titov. He has made many errors: he drives and flies too fast, he has bad marital relations. But he is known not only to the entire country, but to the whole world. To disgrace him would not reflect only on him, but on all of the cosmonauts and the Soviet Union. Therefore it is finally decided not to take any public action, but to switch him and Beregovoi in the training order for the fourth Soyuz flight. Later Finogenov, head of the VVS range at Vladimirovka, informs Kamanin that flight trials of the new combination parachute/soft landing system will be delayed at least two weeks after the failure of one of the parachute canopy rings in static test. 1964 July 6 - . Voskhod crews selected. - . Nation: Russia. Related Persons: Belyayev, Feoktistov, Gorbatko, Katys, Khrunov, Komarov, Lazarev, Leonov, Sorokin, Volynov, Yegorov. Program: Voskhod. Flight: Voskhod 1. Spacecraft Bus: Vostok. Spacecraft: Voskhod. Kamanin select Volynov, Katys, and Yegorov as the prime crew for the Voskhod flight. Komarov, Feoktistov, and Sorokin will be the backup crew. Lazarev will serve as reserve for both crew physician position. The VVS leadership approves the selection. For the first space walk (the flight designated Vykhod at the time), Belyayev, Leonov, Khrunov, and Gorbatko are in training. All want to be first, but Kamanin finds Leonov and Khrunov to have the best analytical minds, to be able to get themselves out of a jam if something goes wrong. He selects Belyayev and Gorbatko to be trained as spacecraft commanders for the missions. 1964 July 9 - . Voskhod landing system trials - . Nation: Russia. Program: Voskhod. Flight: Voskhod 1. Spacecraft Bus: Vostok. Spacecraft: Voskhod. Three tests of the Voskhod landing system have been made. The soft landing rockets are not firing at the proper moment to cancel all vertical motion at touchdown. .
1964 July 16 - . Voskhod problems - . Nation: Russia. Related Persons: Feoktistov, Katys. Program: Voskhod. Flight: Voskhod 1. Spacecraft Bus: Vostok. Spacecraft: Voskhod. Spacecraft development continues with difficulty, there are many technical discrepancies, most notably with the landing system. The launch of the unmanned test spacecraft is proceeding on schedule, but there is no idea when it will be possible to launch the manned version. Training of the command and physician cosmonauts is proceeding all right, but there is a real question about the third seat. Katys is not bad, but Feoktistov has problems with his vertebrae and large intestine. 1964 July 20 - . Voskhod training - . Nation: Russia. Related Persons: Katys, Severin, Volynov, Yegorov. Program: Voskhod. Flight: Voskhod 1. Spacecraft Bus: Vostok. Spacecraft: Voskhod. 1964 July 24 - . Voskhod flight slips - . Nation: Russia. Program: Voskhod. Flight: Voskhod 1. Spacecraft Bus: Vostok. Spacecraft: Voskhod. Crew training is proceeding normally and the crews will be ready by the scheduled 1 August date. On the other hand the date for launch of the first manned mission has slipped from 15 August well into September. .
1964 August 12 - . Voskhod State Commission - . Nation: Russia. Related Persons: Feoktistov, Katys, Komarov, Korolev, Lazarev, Sorokin, Volynov, Yegorov. Program: Voskhod. Flight: Voskhod 1. Spacecraft Bus: Vostok. Spacecraft: Voskhod. The readiness of two crews is certified (the prime crew of Volynov, Katys, and Yegorov and backup crew of Komarov, Feoktistov, and Sorokin). Korolev presses for Feoktistov to be included in the prime crew, citing his unequalled technical knowledge of the spacecraft. Kamanin and the VVS doctors oppose this, citing his poor medical condition which makes him uncertifiable for flight. A very heated discussion ensues, with the final decision to continue training all seven cosmonauts, with the first candidates for flight being Volynov, Katys, and Yegorov, with Komarov, Lazarev, and Sorokin being reserve cosmonauts. The question of Feoktistov's flight certification will be taken up by a special panel of physicians. 1964 August 15 - . LV Family: Proton. Launch Vehicle: Proton-K.
Chief Designers review of Voskhod at OKB-1 - . Nation: Russia. Related Persons: Chelomei, Khrushchev, Sergei. Program: Voskhod. Flight: Voskhod 1. Spacecraft: LK-1, Voskhod. All concerned designers, bureaux, and institutes certify the reliability of the systems of the spacecraft and launch vehicle. The second phase of trials of the soft landing system have been successful. Of 10 drops, 9 landed with vertical velocity under 7.5 m/s, and of those, 6 landed with a speed of only 0.0 to 1.5 m/s. There are still concerns about how the system will function in soft soils or adverse weather conditions. Nevertheless the decision is taken to ship the spacecraft to the cosmodrome for final preparations between 18 and 25 August. It is likely that the manned flight cannot occur until the end of September. Later in the day Kamanin is visited by Sergei Nikitovich Khrushchev and other experts from Chelomei's design bureau. They brief Kamanin on plans for a manned circumnavigation of the moon using their spacecraft launched by their UR-500 booster by the end of 1967. 1964 August 18 - . Aviation Day in Moscow - . Nation: Russia. Related Persons: Feoktistov, Gagarin, Nikolayev, Tereshkova. Program: Voskhod. Flight: Voskhod 1. Spacecraft Bus: Vostok. Spacecraft: Voskhod. Kamanin is able only to offer Gagarin, Nikolayev, and Tereshkova for the presidium the day before. Later he hears that the special physician's panel is unanimous - Feoktistov will never be allowed to fly in space due to his condition..
1964 August 21 - . VPK Meeting on Voskhod - . Nation: Russia. Program: Voskhod. Flight: Voskhod 1. Spacecraft Bus: Vostok. Spacecraft: Voskhod. The Military-Industrial Commission, following statements by the Chief Designers, sets the launch of the prototype Voskhod with mannequins for 5 September followed by the manned flight between 15 and 20 September..
1964 August 26 - . Voskhod crews - . Nation: Russia. Related Persons: Katys, Korolev, Yegorov. Program: Voskhod. Flight: Voskhod 1, Voskhod 2. Spacecraft: Berkut, Voskhod. Composition of the crew for Voskhod continues to be debated intensively. There has been talk of the medical unsuitability of Katys and Yegorov. Later Kamanin discusses progress with the Vykhod mission based on their work at Factory 918 and LII. Many technical details have to be worked out -- movement in open space, the space suit, airlock, communications, etc. The work is in two steps: first to solve simply doing spacewalk, and then how to control and manoeuvre the spacecraft when a cosmonaut is outside. Korolev seems to think that enthusiasm will solve all problems, but Kamanin is concerned of the demonstrated unreliability of Korolev's Luna, Mars, and Molniya unmanned spacecraft. 1964 August 27 - . Voskhod crew manoeuvring. - . Nation: Russia. Related Persons: Feoktistov, Komarov, Lazarev, Rudenko, Volynov. Program: Voskhod. Flight: Voskhod 1. Spacecraft Bus: Vostok. Spacecraft: Voskhod. Rudenko raises objections to the crew selections. Kamanin suggests the most qualified and fit crew would be Volynov, Komarov, and Lazarev. Marshal Rudenko informs the crew must consist of a commander, a physician, and an engineer. Furthermore yet another commission has been convened to clear Feoktistov for flight. Kamanin is infuriated - after a selection process, beginning with 150 candidates from VVS alone, the leadership is hand-selecting the crew in defiance of the fair and rational selection process. 1964 August 29 - . Voskhod launch preparations - . Nation: Russia. Related Persons: Korolev. Program: Voskhod. Flight: Voskhod 1. Spacecraft Bus: Vostok. Spacecraft: Voskhod. Korolev is to leave for Baikonur tomorrow. The launch of the first Voskhod, with mannequins aboard, is set for 7-8 September, with the crewed flight no earlier than 20 September. Kamanin plans to fly to Baikonur on 2-3 September..
1964 August 31 - . Katys deleted from Voskhod prime crew. - . Nation: Russia. Related Persons: Feoktistov, Katys, Yegorov. Program: Voskhod. Flight: Voskhod 1. Spacecraft Bus: Vostok. Spacecraft: Voskhod. It is discovered that Katys has a brother and sister living in Paris, a fact he did not disclose during the selection process. They left for Paris in 1910, 16 years before Katys was even born. But together with the fact that his father was executed by the Soviet state, it makes him unsuitable to be a cosmonaut. Yegorov and Feoktistov are making serious efforts to be appointed to the crew. Yegorov did poorly in zero-G training and Feoktistov is physically unqualified. Meanwhile TASS, APN, and other Soviet newspapers are stubbornly pursuing information about the crew for the forthcoming flight. Film biographies and press kits are being made of all of the candidates, so that the information can be released once the final crew - whoever they are - are in orbit. But this violation of secrecy disturbs Kamanin. 1964 September 2 - . Katys plea - . Nation: Russia. Related Persons: Katys, Korolev, Leonov, Tyulin. Program: Voskhod. Flight: Voskhod 1, Voskhod 2. Spacecraft: Berkut, Voskhod. Katys insists that he knew nothing of his brother and sister living in Paris. His father had these children before 1910, when they left with their mother for Paris. His father did not marry Katys' mother until 1924. His father was arrested in 1931, when Katys was only 5 years old. Meanwhile Tyulin recommends that Kamanin delay his departure for Baikonur by 2 to 3 days. The launch vehicle for the first test mission hasn't been delivered yet. There are still problems with the landing system. In a test at Fedosiya on 29 August, the capsule was dropped from an aircraft with the parachute hatch already opened. Normally this would be ejected by a barometric switch at 7 to 8 km altitude. So the tests have not really proven the end-to-end function of the landing system. 2 to 3 months would be needed to correctly wring out the system, which is still showing many bugs. Instead Korolev now says that the first Voskhod flight will take place no earlier than 10-15 September, and the first manned flight has realistically moved into October. The 3KD Vykhod flight Korolev still plans by the end of the year, but Kamanin believes it cannot take place until 1965. Leonov reports that there are still a lot of problems and defects with the spacesuit being designed for the space walk. Finally two VVS officers have discovered there is a real problem with Voskhod internal temperatures post-landing. Since the crew compartment hatch will not be ejected as in Vostok, they estimate that temperatures will reach 40 deg C at 11 minutes after landing, peaking at 60 deg C 5 to 8 minutes after that. They recommend that the crew has to be able to open the external air vents manually - currently they only open automatically 11 minutes after landing. 1964 September 8 - . Crash at Fedosiya - . Nation: Russia. Related Persons: Korolev. Program: Voskhod. Flight: Voskhod 1. Spacecraft Bus: Vostok. Spacecraft: Voskhod. A Voskhod capsule is finally dropped from 10 km altitude in order to test the parachute hatch ejection mechanism. The hatch fails to deploy, the parachute never opens, and the capsule crashes to earth. Korolev claims the test capsule's electrical scheme is not representative of the production capsule, and promises to ship a production representative capsule, which he guarantees will be reliable, to Fedosiya by 22 September. 1964 September 9 - . LV Family: R-7. Launch Vehicle: Voskhod 11A57. Voskhod preparations - . Nation: Russia. Related Persons: Korolev, Krylov, Rudenko. Program: Voskhod. Flight: Voskhod 1. Spacecraft: Voskhod, Zenit-4. Kamanin arrives at the cosmodrome, only to find the launch of the manned Voskhod delayed to October. The launch of a Zenit-4 spy satellite, that uses the same launch vehicle as planned for Voskhod, has aborted on the pad after the Block A strap-on failed to ignite. This is the first block A failure in over 100 R-7 launches. That evening Kamanin views a launch of an R-36 heavy ICBM. Marshall Krylov reveals it will have a range of 14,000 km with a CEP of under 1 km with a 40 megaton warhead - one missile is sufficient to wipe out a city like New York. Rudenko believes that the victor in any nuclear war will be the one who pushes the button first. Krylov disagrees, saying that if the Americans would launch an attack on Soviet missile forces, the Soviet Union would launch its missiles on a counter-strike before the American missiles arrive - total and senseless destruction. Rudenko believes that Rudenko is more correct, since in the real-world responses will not conform to theoretical possibilities of instant reaction. Later the state commission meets to consider the launch of the first Voskhod. The unpleasantness at the landing trials in the Crimea reveal only the inadequacy of the design of the test capsules, and do not reflect the flight system, says Korolev. He certifies the reliability of the Voskhod for flight. The commission decides to set the launch of the next Zenit-4 reconnaissance satellite for 14 September; that of the Voskhod with mannequins on 18-20 September; the definitive landing system trial at Fedosiya on 23 September; and if that is successful, launch of a manned Voskhod by the end of September. 1964 September 13 - . 09:50 GMT - . Launch Site: Baikonur. Launch Complex: Baikonur LC1. LV Family: R-7. Launch Vehicle: Voskhod 11A57. Cosmos 45 - . Mass: 6,300 kg (13,800 lb). Nation: Russia. Related Persons: Korolev. Agency: Korolev bureau. Program: Voskhod. Class: Surveillance. Type: Military surveillance satellite. Flight: Voskhod 1. Spacecraft Bus: Vostok. Spacecraft: Zenit-4. Duration: 5.00 days. Decay Date: 1964-09-18 . USAF Sat Cat: 880 . COSPAR: 1964-055A. Apogee: 311 km (193 mi). Perigee: 203 km (126 mi). Inclination: 64.90 deg. Period: 89.60 min. 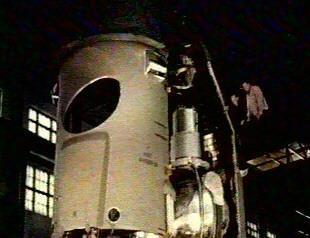 High resolution photo reconnaissance satellite; returned film capsule; also carried weather experiments. The Zenit-4 launches a day ahead of schedule. The booster rocket performs perfectly as Korolev and Kamanin watch from the veranda of the IP-1 tracking station. This confirms readiness of the same launch vehicle for the Voskhod launch. 1964 September 14 - . Voskhod abort system - . Nation: Russia. Related Persons: Feoktistov, Komarov, Korolev, Krylov, Lazarev, Volynov, Yegorov. Program: Voskhod, Lunar L1, Lunar L3. Flight: Voskhod 1. Spacecraft: LK-1, Voskhod. Kamanin reviews the Voskhod abort system with Korolev. Up to T+27 seconds, there is no possibility of saving the crew in the event of a booster failure; from T+27 seconds to T+44 seconds, escape would be difficult, but is possible; and from T+44 seconds to T+501 seconds abort should be possible, with the capsule landing on Soviet territory. Afterwards, Korolev speaks with Kamanin secretly and privately. Korolev reveals that he has discussed a greater VVS role in space with Marshal Krylov, but that Krylov is adamantly opposed to the VVS assuming such a mission. Korolev is seeking a resolution from the Communist Party that will authorise him to develop a manned lunar flyby and landing system using his N1 booster. He believes that Chelomei's UR-500 booster will not have sufficient payload to mount a manned flyby - a docking in low earth orbit will be required. But Chelomei has rejected the use of docking, and is even designing his UR-700 to allow a lunar landing without the use of docking. Finally Korolev gets to the purpose of the secret meeting. He wants Feoktistov to be aboard Voskhod 1, despite the opinion of Kamanin and the physicians. Kamanin reiterates that the most qualified crew would be Komarov, Volynov, and Lazarev; and if he gives in on Feoktistov, then Komarov, Feoktistov, Lazarev. But Korolev is opposed to Lazarev, and insists that the crew should be Komarov, Feoktistov, and Yegorov. From Kamanin's point of view this is flying a space mission with two invalids aboard. Lazarev is a qualified and fit flight surgeon, a qualified pilot as well as a physician with 15 years of research experience in aviation medicine. Korolev is adamant that the two passengers should be civilian, not military. No agreement is possible. 1964 September 15 - . Baikonur facilities - . Nation: Russia. Related Persons: Korolev. Program: Voskhod. Flight: Voskhod 1. Spacecraft Bus: Vostok. Spacecraft: Voskhod. Kamanin inspects the cosmonaut's hotel. The 18-room 2-story building has been completed, but work hasn't even started on any of the sports facilities that were supposed to adjoin it. This is all that is completed after four years of work. Later the final abort instruction manual and mission control authority are hammered out between Korolev and Kamanin. Korolev wants to make sure he retains authority over the mission. 1964 September 16 - . Baikonur abuzz - . Nation: Russia. Related Persons: Chertok, Khrushchev, Tsybin. Program: Voskhod. Flight: Voskhod 1. Spacecraft Bus: Vostok. Spacecraft: Voskhod. The cosmodrome is a beehive of activity, not just for the unmanned Voskhod launch, now set for 18 September, but also for the impending visit of Premier Khrushchev on 24 September. Meanwhile Tsybin, Chertok, Kholodkov, and Vinokur are hurriedly implementing and testing changes made to the landing system as a result of the failures at Fedosiya. This will likely slip the mannequin launch to the end of September. 1964 September 17 - . State Commission delayed. - . Nation: Russia. Program: Voskhod. Flight: Voskhod 1. Spacecraft Bus: Vostok. Spacecraft: Voskhod. The meeting is pushed back a day due to continued delays in proving the changes in the Voskhod landing system..
1964 September 18 - . Voskhod State Commission - . Nation: Russia. Related Persons: Chertok, Kerimov, Korolev, Mrykin, Rudenko, Tyulin. Program: Voskhod. Flight: Voskhod 1. Spacecraft Bus: Vostok. Spacecraft: Voskhod. The State Commission meets at Baikonur. Chertok advises that the failure of the parachute hatch to jettison in the trials in Fedosiya was due to a serious defect in the schematics of the electrical layout and will not occur again. Korolev declares he is ready to certify Voskhod ready for the final drop test at Fedosiya but would prefer to delay the launch of the spacecraft with mannequins until after the Fedosiya test. The state commission finally agrees to reschedule the launch from 28-30 September, subject to a successful test at Fedosiya on 24-25 September. Aftrwards Tyulin calls Korolev, Mrykin, Kerimov, Rudenko, and Kamanin aside. He tells them the Communist Party and Soviet Ministers have now taken a personal interest in the crew selection for Voskhod. Korolev and Kamanin bitterly debate their competing preferred crews. 1964 September 24 - . Voskhod crew ready - . Nation: Russia. Related Persons: Belyayev, Feoktistov, Gagarin, Katys, Khrunov, Khrushchev, Komarov, Lazarev, Sorokin, Volynov, Yegorov. Program: Voskhod. Flight: Voskhod 1. Spacecraft Bus: Vostok. Spacecraft: Voskhod. Kamanin arrives at Baikonur. All is ready for the Voskhod launch, except the spacecraft. Kamanin conducts a final readiness review with Volynov, Komarov, Katys, Feoktistov, Yegorov, Sorokin, and Lazarev. He tells them that every one of them must do his utmost to be physically and psychologically ready for the flight, since the final crew selection will not be made until 2 or 3 days before the launch. Gagarin, Belyayev, and Khrunov are at the cosmodrome, where they are showing the Vykhod spacecraft to Khrushchev. Later Kamanin discusses the crew selection with the military leadership. The top brass have no interest in space and seem to be ready to give in to Korolev. This invalidates everything Kamanin was worked for in terms of establishing a systematic method of cosmonaut selection, training, and crew selection. 1964 September 29 - . Voskhod launch preparations - . Nation: Russia. Related Persons: Korolev, Tyulin. Program: Voskhod. Flight: Voskhod 1. Spacecraft Bus: Vostok. Spacecraft: Voskhod. Kamanin meets Korolev at the MIK assembly building at 09:30. Korolev is preoccupied - his wife is in the Kremlin hospital, scheduled for surgery on 1 October. It is a dangerous diversion when all his powers and concentration need to be devoted to clearing the spacecraft for flight. There has been a problem in installing the second seat in the capsule; it won't clear the hatch by 3 mm. At 10:00 Kamanin reviews preparations of the Baikonur recovery forces for a launch abort. He secretly believes, in view of Voskhod's unreliability and unsafe nature, that all such preparations are mainly psychological and of little realistic effectiveness. At 17:00 the State Commission meets to assess launch readiness. Tyulin reveals that the Tral 1P telemetry system aboard Voskhod has failed. The diagnosis is clear, but it will take 6 to 7 days to get a replacement. The tracking ships in the Pacific and Indian Oceans have been there since August, based on Korolev's originally guaranteed launch date. They will run out of supplies by 5-10 October. Finally it is decided that the boosters and spacecraft for both Voskhod missions will be completed in parallel. The launch of the first spacecraft will be will be delayed to 6 October at 10:00 Moscow time. The manned Voskhod will launch no more than six days after the test with mannequins. The tracking ships will be ordered to stay at sea until 15 October. Korolev leaves for Moscow for two days to be with his wife. The second group of cosmonauts are at the cosmodrome to observe spacecraft and launch preparations; now their visit will have to be extended significantly. Voskhod slips - . Nation: Russia. Related Persons: Bogomolov, Korolev. Program: Voskhod. Flight: Voskhod 1. Spacecraft Bus: Vostok. Spacecraft: Voskhod. Kamanin is disgusted. The countdown for Voskhod was planned out for 146 hours; now Bogomolov reveals that this is 40 hours too little for all tasks. Korolev suddenly announced on 29 September that he planned to launch the next two Voskhod spacecraft in November, although everyone knows this cannot be possible until March-April 1965 at the earliest. Kamanin cannot understand this constant unrealistic, unprofessional planning. 1964 October 2 - . Voskhod slips again - . Nation: Russia. Program: Voskhod. Flight: Voskhod 1. Spacecraft Bus: Vostok. Spacecraft: Voskhod. The mannequin launch is now set for 6-8 October, and the manned launch to 12-14 October. Kamanin is looking forward to Korolev's return to Baikonur in order to confront him over the crew selection. .
1964 October 3 - . Voskhod integration problems - . Nation: Russia. Related Persons: Korolev. Program: Voskhod. Flight: Voskhod 1. Spacecraft Bus: Vostok. Spacecraft: Voskhod. Work on completing the spacecraft is finally on schedule, but then it is found that there is a failure in the Signal device, which provides communications after the separation of the capsule from the equipment section after retrofire. Nevertheless it is decided to continue according to schedule and roll the booster and spacecraft out to the pad the next morning. Korolev has spent the day at Fedosiya, where the Voskhod landing system has finally completed a successful end-to-end test after being dropped from an aircraft at 10 km altitude. 1964 October 4 - . Voskhod crews arrive - . Nation: Russia. Related Persons: Feoktistov, Katys, Komarov, Volynov, Yegorov. Program: Voskhod. Flight: Voskhod 1. Spacecraft Bus: Vostok. Spacecraft: Voskhod. At 15:30 the Voskhod cosmonauts arrive aboard an An-10 at Baikonur and are greeted by Korolev and others. Although they have not been told officially, Kamanin is sure that Volynov and Katys have heard that the State Commission finally selected Komarov, Feoktistov, and Yegorov for the flight. In the evening Kamanin plays tennis with the flight crew and is surprised - Yegorov and Feoktistov play well, and Komarov played poorly. 1964 October 5 - . Voskhod cleared for flight - . Nation: Russia. Program: Voskhod. Flight: Voskhod 1. Spacecraft Bus: Vostok. Spacecraft: Voskhod. The Tral 1P device has arrived and is installed. The state commission sets launch for the Voskhod with two mannequins for 10:00 on 6 October. 1964 October 6 - . 07:12 GMT - . Launch Site: Baikonur. Launch Complex: Baikonur LC1. LV Family: R-7. Launch Vehicle: Voskhod 11A57. Cosmos 47 - . Payload: Voskhod 3KV s/n 2. Mass: 5,320 kg (11,720 lb). Nation: Russia. Related Persons: Kirillov, Korolev, Rudenko, Tyulin. Agency: Korolev bureau. Program: Voskhod. Class: Manned. Type: Manned spacecraft. Flight: Voskhod 1. Spacecraft Bus: Vostok. Spacecraft: Voskhod. Duration: 1.01 days. Decay Date: 1964-10-07 . USAF Sat Cat: 891 . COSPAR: 1964-062A. Apogee: 383 km (237 mi). Perigee: 174 km (108 mi). Inclination: 64.60 deg. Period: 90.10 min. Unmanned test of Voskhod spacecraft. At 07:00 the State Commission meets at Area 2. All Chief Designers, Commanders, and Section report that all is ready for flight. The commission gives the order to proceed with the launch. Weather at the pad is 7 balls, 8-10 m/s wind with gusts to 15 m/s, temperature 9 to 12 deg C. Weather in the recovery zones is reported as winds up to 15 m/s. Weather in the recovery zone is not clear, but that is not considered an impediment, and in fact Kamanin would like to see how the landing system functions in bad conditions. Kamanin visits the pad at T-30 seconds; at T-20 seconds, the veranda at IP-1 has over 50 viewers of the launch, including 15 cosmonaut candidates and the 7 Voskhod cosmonauts. Kamanin is relegated to the IP-1 veranda this time, with Rudenko, Kirillov, and Tyulin the bunker adjacent to the pad. Korolev stays with the booster until T-5 minutes, then enters the bunker. The booster ignites precisely at 10:00; the strap-ons burn out and are jettisoned at T+120 seconds; the core burns out and the final stage ignites at T+290 seconds; and at T+523 seconds spacecraft 3KV number 2 is placed in orbit as the final stage shuts down. The spacecraft separates and all systems look normal. Recovered October 7, 1964 7:28 GMT. Officially: Investigation of the upper atmosphere and outer space. 1964 October 7 - . LV Family: R-7. Launch Vehicle: Voskhod 11A57. Cosmos 47 returns to earth. - . Nation: Russia. Program: Voskhod. Flight: Voskhod 1. Spacecraft Bus: Vostok. Spacecraft: Voskhod. At 7 am the Cosmos 47 landing commission convenes. Kamanin has had only three hours sleep. The spacecraft is to conduct retrofire on its 17th orbit of the earth and land in Kustan, where winds are 15-17 m/s. The capsule made a good landing, with the parachute-rocket soft landing system working perfectly - the spacecraft had zero velocity on impact with the ground. The spacecraft penetrated 90 mm into the ground. The strong winds caught the parachute after landing and dragged it 160 m, but if a crew had been aboard they could have quickly commanded separation of the parachute. All systems of the booster and spacecraft worked perfectly, except that the third stage engines' thrust fell by 10% for three seconds, but the engine controller detected the shortfall and made up the velocity. 1964 October 8 - . LV Family: R-7. Launch Vehicle: Voskhod 11A57. Cosmos 47 capsule returned to Baikonur. - . Nation: Russia. Related Persons: Kosberg. Program: Voskhod. Flight: Voskhod 1. Spacecraft Bus: Vostok. Spacecraft: Voskhod. The capsule arrived aboard an An-12 at 11:30. All systems performed well. It is reported that one of Kosberg's third stage engines developed an out-of-control high frequency oscillation in a stand test, and exploded. The State Commission decides to delay the manned Voskhod launch 3 or 4 days while the safety of the engines on the booster are verified. A special commission is sent to Voronezh to assess the situation. Kosberg's engines have flown 60 times, and been tested on the stand 400 times, without this problem having occurred before. In the evening seven reporters arrive from the Soviet press and begin their work leading up to the manned launch. 1964 October 9 - . Cosmos 47 teardown - . Nation: Russia. Related Persons: Feoktistov, Komarov, Korolev, Rudenko, Tkachev, Tyulin, Yegorov. Program: Voskhod. Flight: Voskhod 1. Spacecraft Bus: Vostok. Spacecraft: Voskhod. At 10:00 Korolev, Tyulin, Rudenko, Tkachev, and other leaders examine the capsule. The condition of the parachute, and capsule exterior and interior show how well the soft landing system functioned. Then they examine the Voskhod s/n 3 which will be sued for the manned flight. The crew of Komarov, Yegorov, and Feoktistov take their place in the cabin, and Korolev and Kamanin examine the cramped accommodations and ask Komarov questions to verify his understanding of the ship's controls. For an hour from 16:00 the crew is interviewed by news correspondents. After the interview, the crew plays tennis for the benefit of photographers. Afterwards post-flight examinations are discussed. A suggestion that the crew spends three nights in a hospital after the flight is rejected. Instead they will spend three nights in the cosmonaut's quarters at Baikonur, under medical observation. Finally, the State Commission meets to verify the crew selection. The session is filmed and recorded for later use by the press. 1964 October 10 - . Voskhod-1 State Commission - . Nation: Russia. Related Persons: Korolev, Kosberg. Program: Voskhod. Flight: Voskhod 1. Spacecraft Bus: Vostok. Spacecraft: Voskhod. Kosberg testifies that the problem that led to the engine explosion on the test stand was due to the stand itself and would not occur with a flight engine. Korolev agrees, and recommends launch based on the successful flight record of the engine, the successful Cosmos 47 test mission, and the completion of two successful end-to-end drop tests of the soft landing system. The commission sets launch for 12 October at 10:30 Moscow time. 1964 October 11 - . Voskhod-1 preparations - . Nation: Russia. Related Persons: Korolev, Ustinov. Program: Voskhod. Flight: Voskhod 1. Spacecraft Bus: Vostok. Spacecraft: Voskhod. The landing commission meets at 09:00. Emergency landing arrangements for each orbit are examined. Weather at both launch and landing sites is predicted to be excellent - clear, 5 m/s wind. Komarov is given Communist relics to be taken into space and returned to earth - a portrait of Marx which had belonged to Lenin, a photo of Lenin holding a copy of Pravda, and a banner from the Paris Commune. At 16:00 the crew meets with the garrison of Area 2 and thanks the launch team for all of their hard work. Afterwards Korolev takes the crew to the capsule and gives final instructions. Around 18:00 there is an emergency meeting in Korolev's office. A defect in the transmitter of the Tral system was detected at 14:30, , and it is not possible to easily get at the equipment any more. There is a dispute as to how long it would take to change out the equipment - estimates range from 10 minutes to two hours. In any case, Korolev had not been informed, but the Soviet hierarchy has already learned of the problem. Korolev flies into a rage, something Kamanin has not seen in four years of working with Korolev. Korolev settles the matter by calling Ustinov on the VCh scrambler phone and personally certifying that the booster and spacecraft are ready for flight. 1964 October 12 - . 07:30 GMT - . Launch Site: Baikonur. Launch Complex: Baikonur LC1. LV Family: R-7. Launch Vehicle: Voskhod 11A57. Voskhod 1 - . Call Sign: Rubin (Ruby ). Crew: Feoktistov, Komarov, Yegorov. Backup Crew: Katys, Lazarev, Volynov. Payload: Voskhod 3KV s/n 3. Mass: 5,320 kg (11,720 lb). Nation: Russia. Related Persons: Gagarin, Korolev, Rudenko, Tyulin. Program: Voskhod. Class: Manned. Type: Manned spacecraft. Flight: Voskhod 1. Spacecraft Bus: Vostok. Spacecraft: Voskhod. Duration: 1.01 days. Decay Date: 1964-10-13 . USAF Sat Cat: 904 . COSPAR: 1964-065A. Apogee: 336 km (208 mi). Perigee: 178 km (110 mi). Inclination: 64.70 deg. Period: 89.60 min. 1964 October 13 - . Landing of Voskhod 1 - . Return Crew: Feoktistov, Komarov, Yegorov. Nation: Russia. Related Persons: Babiychuk, Feoktistov, Gagarin, Khrushchev, Kirillov, Komarov, Korolev, Kuznetsov, Nikolayev, Rudenko, Smirnov, Tyulin, Yegorov. Program: Voskhod. Flight: Voskhod 1. Spacecraft Bus: Vostok. Spacecraft: Voskhod. 1964 October 15 - . Word of Khrushchev's removal made public. - . Nation: Russia. Related Persons: Brezhnev, Khrushchev, Korolev, Tyulin. Program: Voskhod. Flight: Voskhod 1, Voskhod 2. Spacecraft Bus: Vostok. Spacecraft: Voskhod. Five aircraft are necessary to fly all of the VVS staff and engineering workers back to Moscow. Word has come through that Khrushchev has been removed from his posts, with Brezhnev now the First Secretary of the Communist Party and Kosygin now Premier of the Soviet Ministers. Kamanin's opinion was that Khrushchev was not in the same league as Lenin or Stalin, and that he would have only a minor place in history, but he is surprised by his sudden downfall. Tyulin believes that Korolev's promise to Khrushchev to fly Vykhod in November is now nullified, and that a more reasonable date of March-April 1965 can be set. 1964 October 18 - . Preparations for return to Moscow - . Nation: Russia. Related Persons: Komarov, Malinovskiy, Yegorov, Yeliseyev. Program: Voskhod. Flight: Voskhod 1. Spacecraft Bus: Vostok. Spacecraft: Voskhod. The Voskhod 1 crew memorise and rehearse the speeches they will deliver to the leadership and masses on their return to Moscow. Later Kamanin plays tennis with the crew. Kamanin believes that Malinovskiy has finally become more supportive of Soviet manned spaceflight, which can be seen as a reflection of the country's military potential. Unwavering support will be needed to fulfil the recently approved space plan, which foresees manned docking operations in orbit, a manned flyby of the moon, a manned lunar landing, and missions of 20 to 30 days in earth orbit. 1964 October 19 - . Voskhod 1 crew in Moscow - . Nation: Russia. Related Persons: Biryuzov, Brezhnev, Feoktistov, Komarov, Yegorov. Program: Voskhod. Flight: Voskhod 1. Spacecraft Bus: Vostok. Spacecraft: Voskhod. 1964 October 20 - . Cosmonaut meeting at OKB-1 - . Nation: Russia. Related Persons: Feoktistov, Keldysh, Komarov, Korolev, Mozzhorin, Tyulin, Yegorov. Program: Voskhod. Flight: Voskhod 1. Spacecraft Bus: Vostok. Spacecraft: Voskhod. The traditional meeting with the crew is followed by a smaller group in Korolev's office. Numerous toasts are drunk to the crew, to future victories in space, and... "on to the moon". From 18:00 to 20:00 the cosmonauts are prepared by Keldysh, Tyulin, Pashkov, Skuridin, Mozzhorin, Rumyanets, and others in allowable answers for the next day's press conference. Kamanin wants the crew to be free to answer questions about the physical characteristics of the booster and spacecraft (thrust, weight, dimensions, and so on) but Keldysh and Tyulin prohibit it strongly. Voskhod plans - . Nation: Russia. Related Persons: Feoktistov, Komarov, Yegorov. Program: Voskhod. Flight: Voskhod 1, Voskhod 2, Voskhod 3, Voskhod 4, Voskhod 5, Voskhod 6. Spacecraft: Berkut, Voskhod. The Voskhod 1 crew have completed their post-flight debriefings and final report. Plans for 1965 are laid out. The Vykhod spacewalk flight will be made in the first quarter of 1965. Of the five Voskhod spacecraft, that are to be completed in the first quarter of 1965, the following program is laid out: two will be devoted to flights of a single cosmonaut, without a spacesuit, on endurance missions of 12 to 15 days. Two will be used for scientific research missions. One will be used to repeat the spacewalk of the Vykhod mission. 1964 November 6 - . Well deserved rest - . Nation: Russia. Related Persons: Feoktistov, Komarov, Yegorov. Flight: Voskhod 1. The cosmonauts will go to a rest area on 8 November. Kamanin is going on leave from 9 November to 20 December. On this last day of work, several cosmonauts receive the Vietnamese Hero of Socialist Labour medal from Vietnamese premier Pham Van Dong..
1964 December 30 - . Western reports - . Nation: Russia. Related Persons: Biryuzov, Brezhnev, Komarov. Program: Voskhod, Lunar L1. Flight: Soyuz A-1, Soyuz A-2, Soyuz A-3, Soyuz A-4, Voskhod 1, Voskhod 2. Spacecraft: Soyuz A, Soyuz B, Soyuz V, Voskhod. A corespondent from the APN agency calls Kamanin and wants to know if the official press should react to the claims of a Belgian professor that all of the Soviet cosmonauts have returned from space with serious psychological problems. Kamanin says there is nothing to it, but that the best course is to ignore the report and publish no official response. Kamanin looks forward to the missions planned in the new year: first the Vykhod, the first spacewalk, followed by a 10 to 12 day mission by a single cosmonaut, then later crews of first two, and then five to six in joined Soyuz spacecraft. In 1966 the first space docking is planned, followed by the first lunar flyby. Kamanin feels apprehensive, though. All manned flights have been completed to date without a serious problem, whereas Soviet unmanned spacecraft have been extremely unreliable and failed more often than not. He attributes this to the involvement of the VVS in the manned flights, whereas the RVSN rocket forces were responsible for the others. He worries that, with the ascendancy of Brezhnev and the death of Biryuzkov, that standards will drop in the future. Indeed, the RVSN has asked if Komarov could transfer officially from the VVS to the RVSN, a move that Kamanin vigorously opposes. At least progress on improvements at TsPK are underway. One apartment building with 75 apartments for cosmonauts is already finished, and an 11 story building should be finished in 1965, as well as schools, nurseries, stores, and so on. Currently there are 17 active cosmonauts and 13 candidate cosmonauts in training. An additional 40 will have to be recruited in 1965 to support the ambitious space plans recently adopted. 1965 February 8 - . Voskhod 2 crew vacuum chamber tests - . Nation: Russia. Related Persons: Belyayev, Korolev, Lazarev, Leonov, Sorokin. Program: Voskhod. Flight: Voskhod 1. Spacecraft Bus: Vostok. Spacecraft: Voskhod. Belyayev and Leonov practice deploying and exiting the airlock at 37 km equivalent altitude in the TBK-60 chamber. The Vega system for keeping track of the spacewalking cosmonaut's life signs fails again. Kamanin is infuriated. Later he discusses future spaceflight plans with Korolev, who was supposed to deliver five Voskhods in 1965. Korolev says that three spacecraft will only be completed by October, and should only be available for flights at the end of the year. He wants to use one as a biosat in an unmanned flight of organisms for 30 days; a second for the flight of a cosmonaut pilot and physician for 15 days; and the third for flight of a cosmonaut and engineer to perform an artificial gravity experiment. 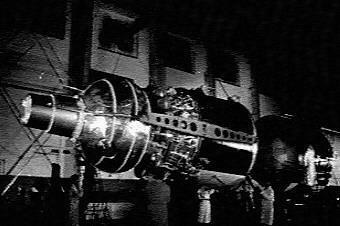 Two further spacecraft will be finished to the Vykhod configuration in October 1965 for flights in March 1966. Nothing is official yet, and Kamanin urges that the necessary resolutions be passed as soon as possible so that training can begin. He thought before that there was little chance that Yegorov's back-ups, Lazarev and Sorokin would fly, but now he puts them back in training so they will be ready for this flight schedule. But Korolev remains opposed to flying either candidate. 1965 March 29 - . Cosmonaut travel plans - . Nation: Russia. Related Persons: Belyayev, Gagarin, Leonov, Nikolayev, Tereshkova, Yegorov. Program: Voskhod. Flight: Voskhod 1. Spacecraft Bus: Vostok. Spacecraft: Voskhod. Tereshkova and Nikolayev are to travel to Algeria on 1 April, and Hungary on 2 April. Yegorov is going to Berlin to deliver a medical lecture. There is an avalanche of fan mail for Belyayev and Leonov. Kamanin believes that Leonov is moving into the pantheon with Gagarin and Tereshkova of top space heroes.